as you know, B[e] have been added in BeSS database recently. 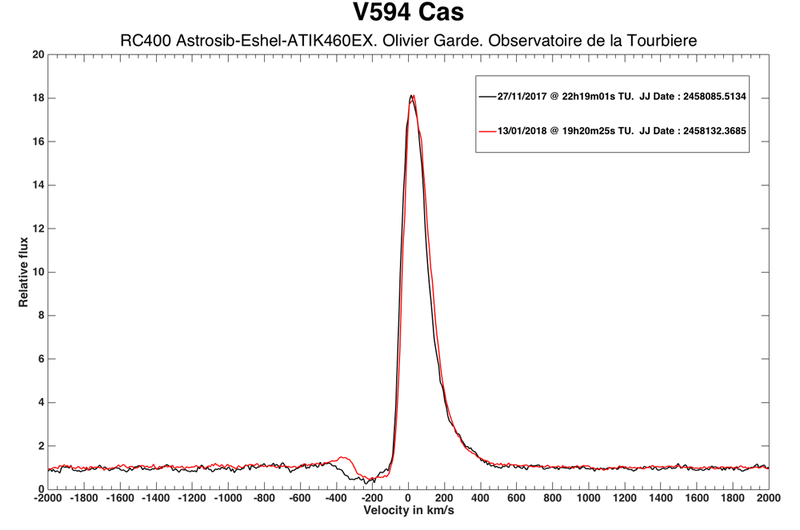 Couple of us recently took spectra of V594 Cas, a magnitude 10.6 B8I[e], and results seem to be very interesting. 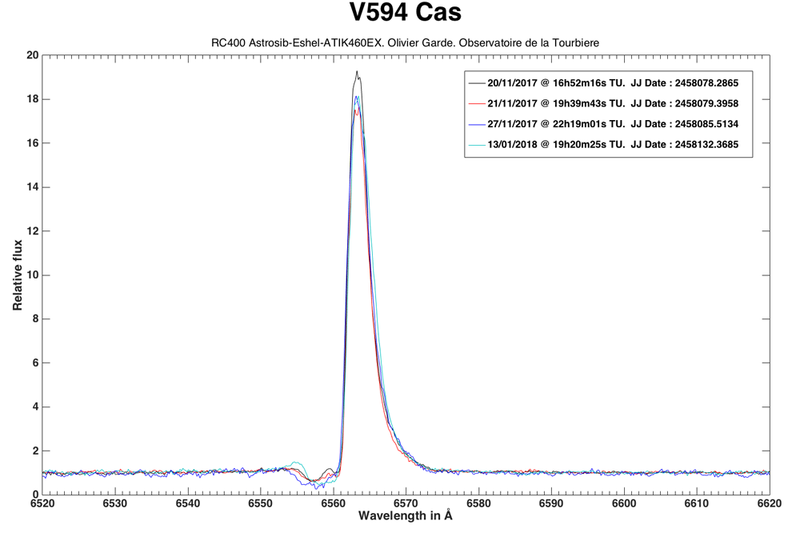 Helpha was showing a P Cygni profile with absorption near -300km/s on nov 16th but absorption disapeared the following night with a small emisson appearing near -150km/s. Then an small absorption was added near -200km/s last night. Michaela Kraus, professional astronomer who is studying those stars, told us that "It is not normal that these objects show such rapid change in their profiles. The appearance of the emission component indicates that some sort of mass ejection is going on right now. It is hard to predict the duration of this event. But it would be excellent if the star could be followed in Halpha over the next say 2-3 weeks to see whether it is a periodic event. Note that the star is embedded in a nebula of ejected material emitting also in Halpha and in the forbidden emission lines." Looking at the litterature, it seems that the nebula is one lobe shape. Anyway, bottom line is that it is worthwhile to take spectra of this B[e] star right now. It is well positionned in the northern hemisphere at the moment. Resolving power above R>5000 is required and because the star is very faint, long exposure is also required. I am taking 2-3 hours exposures typically for such star with R~10000 echelle. Last edited by Olivier GARDE on Sun Jan 14, 2018 4:13 pm, edited 1 time in total.